That’s right. 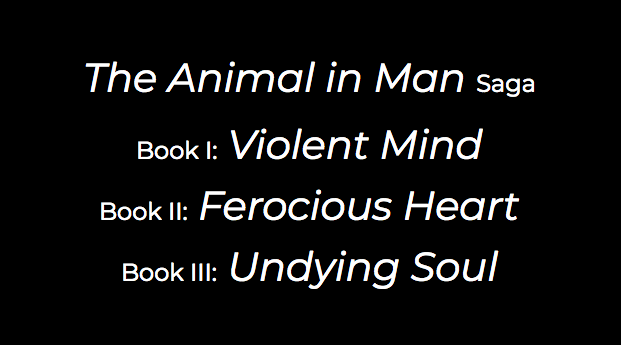 The titles of all three parts of The Animal in Man saga have at last been decided. I painstakingly pondered all the meanings of all the words that reflect the style, atmosphere, and experience I’ve created with the story. And then, suddenly, I had it. What is a [hu]man? What are we, really? We are a mind, a body, and - perhaps - a soul. What if we created a world where we could play at our most violent fantasies? What if we shaped the creatures there in our image? Would they not also be those three things? I asked myself these questions a lot while I was writing The Animal in Man, and when I dug up the old journal entries I’d made about it, I knew I’d found the titles I needed. You can follow the Draft page for The Animal in Man II: Ferocious Heart RIGHT HERE! The second book is already 100% complete, minus the professional-grade editing and services Inkshares provides upon my successful future campaign. That’s where you, my dear animals, can play a part. Please please please click the link and follow the project now so you’ll be ready for the day it starts taking preorders. And of course, as always, thank you so much for your continued support.